My first car purchase. All grown up and living on my own, I didn’t know what I didn’t know and I fell for every sincere sounding bit of advice the dealer told me. He had my best interest in mind, right? No, he wanted to make a great commission and this trusting young 20-something gave it to him. I made that mistake TWICE before I became a car shark myself. Buying a car can be daunting, especially when you want to save money. Heading into the process armed with this arsenal of tips puts you in the drivers seat. If you are in the market for a car, want to save money, and make a solid purchase with no regrets, these are some of the best tips I’ve learned along the way. Define Your Budget and Stick To it! When I graduated from college, my heart won out once again with a car purchase – the dealer’s test drive vehicle. Many assured me this was a great deal and while that may have been true, my youth pastor’s salary had no business buying it. While I figured the monthly loan amount into my budget, it gave me no wiggle room to save or build up an emergency fund. It took me years to understand that investing in a new car with depreciating value is not how to create margin in ones budget. This was the last car purchase I ever made on a loan. I never wanted to feel that monthly stress again due to a vehicle. It’s been over twenty years since I bought that car and it was by far the nicest car I ever drove, but I’ve never regretted the decision to sell it and get out of car debt. Before you start browsing, set your budget and stick to it. Don’t allow your feelings to be swayed by all the new bells and whistles because trust me, those heated seats are amazing. Someone has to buy new cars. I have a few good friends who “needs” the newest model every other year, yet I always hear their financial complaints. 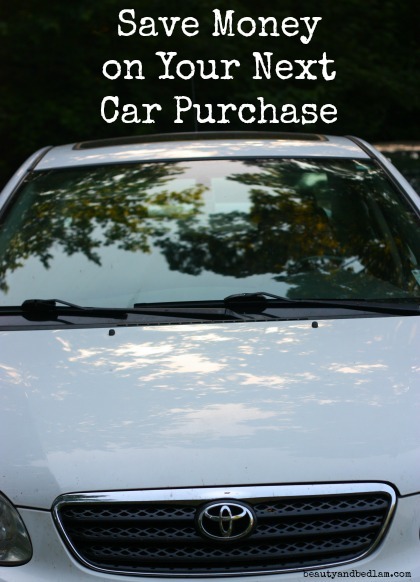 The best way to save a substantial amount of money on a car is purchasing it used. Even buying one that’s one year old will save you thousands. Once a car has been driven off the lot, it depreciates in value. In fact, a new car loses 11% of its value the moment you drive it off the lot, with the first year offering the steepest drop in value, upwards of 20-30%. If you want to save the most money on a car purchase, set your goal on finding a vehicle that is at a minimum of 1 – 2 years old. Any time you purchased used, this is most critical step. Don’t consider the purchase of a used car until the VIN (Vehicle Identification Number) has been checked and cleared. If you have time, order a car title history report from the National Motor Vehicle Title Information System, which shows the full history of a vehicle. You can find out if it was in an accident, a flood, or even if the odometer has been tampered with. If either of these reports come back negative, discontinue with that car. It’s as simple as that. As I mentioned in my post on art of negotiation , knowledge is power. Sellers can sniff out insecure buyers and they will want to use that to their benefit. Before you walk in the door, do your research. Come in as an authority on what you are looking for in terms of prices. Research prices online first, so you have a ball park of what’s a good deal. Research the Kelley’s Blue Book Guide to know the retail price of used cars. You want to purchase for less than that price. The goal is to purchase the vehicle for as close to whole sale value as possible. Come in with a notepad and let them see that you are referencing your research. Refer to other sellers and what they are offering in terms of other similar makes and models, so the seller knows you mean business. Do not share how much you want to spend and what your budget is because you have now handed the seller all your leverage. Understand all the options for where to buy used vehicles. The majority of used cars are purchased through dealers. Obviously, the inventory is much larger, so you have more vehicles from which to choose. The process is simpler, but most of the time, buyers will always spend more for that convenience. Again, knowledge is power. Research the dealership and know its reputation. Ask for referral from friends and from those recommendations use their trustworthy salesmen. Look into the manufacturer, dealer incentives and rebates. Make sure to inform the salesmen that you are just gleaning information today with no intention of purchasing until you have visited three other dealers. Timing is critical. Since most sales man work on commission and quotes, they will be much more willing to negotiate at the end of the month, especially if they are close to making their next goal. You must put yourself in control of this sale because salesmen are skilled at impulse purchases. .
Pros of a dealer – It’s a much simpler purchasing process. You can be in and out of a dealer with your new car in hours. They many offer a history report free of charge and offer some sort of warranty or guarantee. Some offer a multi-point check of the vehicle’s systems to see if there are any outstanding issues, but know that you must get this guarantee in writing. Most have a service department or service partner that can take care of issues, as well as financing options. While all these benefits make the process much simpler, you will pay extra for this. Cons of a dealer – hidden charges occur. They are salesmen who make their salary on the highest price possible. You will never be quite sure of the deal you are getting, but they certainly will attempt to upsell and offer additional warranties, but this is never cost effective. Warranties are where they make their extra money. The last time my parents purchased from a dealership, the seller said that their warranty was not optional. That is never true. My parents walked away and as soon as they stepped out the door, the seller quickly “changed” his mind. You must be willing to walk away. Pros – More room for negotiation. Depending on how motivated the seller, you can purchase a vehicle at whole sale value. Remember my first nice car? I just wanted to get out from under the loan and sold it for a loss. The purchaser got a steal. If someone is relocating, they will be under a time crunch and also very motivated. My husband purchased his last two cars through the newspaper. One was purchased from an estate where the two sons needed to unload their mom’s practically brand new car. It was five years old, but only had 30, 000 miles on it. It had been serviced regularly and they were able to show us how religiously she got it tuned up and the oil changed – every 3K miles like clock work. This was one of our best finds ever and two years later, we could still sell it for what we paid. Another option for a private purchase is buying from companies who lease vehicles for their employees. When the lease has ended, they typically turn them back to the dealer for new cars, but we’ve purchased two cars directly from the companies before they turned them in. It was great because we bought them at wholesale value. They had high miles, so the vehicle had fully depreciated, but they were highway miles, so the vehicles were in great condition. Cons – while a dealer will make every attempt to make you happy, a private seller may not have the same motivation.Previous owners may not always be totally honest about the vehicle, so there’s a higher risk involved. This is where asking questions is very important and relying on your first impression of the seller. I am a good gauge of character and know if someone is taking me for a ride. With no guarantees on the vehicle, you must take your time to ask the right questions and inspect it very well. If you at all feel concern, have it checked by your mechanic. While test driving, listen carefully for any odd sounds and ask, ask, ask away. This is where the most risk occurs, but also your best values. This is where car dealers purchase the cars they will eventually sell. We’ve been fortunate with two excellent vehicle purchases from auto auctions. Both times, we were not in immediate need of a vehicle, so we had a few months to browse the auctions. We took our time to make sure they had what we were looking for in terms of make and model and we had a little bit of flexibility in our budget. When two Honda Odysseys came up for auction, we decided to go with the van with less miles. My husband went ahead of time, inspected the vehicle with a friend who knows cars, and did a quick search of the vehicle history before beginning the bidding process. Often times, you can get what you pay for in as-is condition. There are usually no warranties, no money-back guarantee or repair options. Pros – potential to find a great deal, but not if you are in a hurry. You need to take your time. You may still be able to run a vehicle history report if you can get the VIN number before the actual auction. You may be able to find some vehicles that you cannot find anywhere else. Cons – the speed and “excitement” of auctions may cause you to spend more money than you originally budgeted. Again, know your budget and stick to it. Research is critical. Some auctions are online only, so you don’t get the chance to walk around and inspect the vehicle. I’d be more hesitant with that, but you do have the opportunity for some great buys. In our experience, another reasons we don’t want to drive new cars is the much larger insurance premium. We factor that into our purchase and talk to our insurance agent before we make the new purchase. I asked our Allstate insurance expert about the cost savings. Purchasing a used car affects insurance coverage for teenage drivers dramatically. With five children and three teen drivers, our teens drive old cars. Purchasing a used car has the most positive impact on insurance premiums for teen drivers. Designating a younger driver as the principal driver of an older car may affect the cost you pay. However, please note that this will not eliminate them from coverage needs on other vehicles in the household. All teens need to be paired with a car, so it makes sense to align them with one that needs less coverage (in general, older cars are worth less than newer ones). Again, it’s best to speak with your insurance agent or reach out to Allstate to see what makes sense as this thinking may not apply in all instances. Any parents, no matter the age of your child, needs to read “Teen Driving, Their Safety and Paying for it all.” In doing research for this article, I was highly convicted and it has dramatically changed my driving habits. During our time of unemployment, our Hunk O’ Junk taught me some critical life lessons. Read about it in “It Just Doesn’t Matter What You Think” post. It will encourage all of you as you work towards financial freedom. Hopefully, this article gives you a better working knowledge of steps to take before you purchase a new vehicle. What are some of the best tips you’ve found when buying a new (or new to you) vehicle? This has so much great information and I’d never thought about buying at an auto auction. i am book marking it to come back later because you have covered some points I need to dive into. Wow! you are a wealth of information on car buying. I am really great at setting the price (in my mind) and not budging from it, unless, of course, it is to reduce it. But that “walking away” was a real problem the last time I purchased a vehicle. I felt trapped! I went to a big, used car sale. The kind where all the dealers in the area bring all their used cars to one location. There are literally thousands of used cars to look at. And there are big circus tents set up and that is where the sales person takes you to hammer out the details of the transaction. It is full of banquet tables and chairs and people! I got stuck at a table in the very middle of the tent, surround on all sides and when that moment came “to walk away” I was trapped! And the salesman would not leave me alone! I finally got him to walk away so I could “think”, and a couple sitting at the next table said They couldn’t believe how pushy the salesman was being and how relentless he was in not leaving me alone! Anyway, it was an experience. I got the vehicle I wanted and the price I wanted. I am still driving that same vehicle and it has been great for me for almost 7 years! Thank you for these great tips. We will find ourselves shopping for a new car sooner than we would like. I couldn’t agree more that used is the way to go. Thank you for the time it took to write this post. You so welcome and thank YOU for making it to the end because it’s a long one. Yes, it took forever to write and I probably should have split into two posts, but now most of the information is in one spot. I work in the auto industry, this is the most sane advice I’ve seen on the whole internet. Oh, by the way not all of us salespeople are mean and just after your last dollar. When I have a young person in front of me, I treat them like my own kids, I walk them through the process step by step, and I tell every cutomer that they have the right to say no at any point. With my last car purchase, things were not going exactly like I wanted with the final negotiations, so I put the keys on the table and stood up. I also explained to them that I didn’t NEED a new car, my hubby did, and that I’d be fine with him waiting a little bit longer. Another time, I was helping a friend who was a single mom buy a car. The salesman had called her back to the dealership after they’d already settle on a price, trying to tell her that he couldn’t honor the price. I told her before we walked in there to follow my lead, no matter how badly she wanted the car. When the salesman acted like he wasn’t going to budge, I told her to give him the keys back and go get her old car, that we would be taking it back. Well, what do you know? The salesman decided he COULD honor their original deal. I caught your post via Pinterest… just wanted to shed some light on the flip side. Salesman commission does not work like most people think it does. In fact, salesman make next to no money on the sale of a new car. My husband sells VW/Volvo/Porsche and last week he worked on a deal with someone for 3 days, one of those being his day off, and he made $100 commission on the sale. All new cars have a “flat” of $100. So it does’t matter how much you purchase the car for, the salesman gets $100. They make more money on used vehicles, because the dealership packs more profit into those. They will take a car on a $4000 trade-in, and then sell it for 10 thousand, so the salesman may make more money ($300 is considered “excellent” commission on a used car), but if the dealership knocks 3 or 4 thousand dollars off of that price, the salesman might only make $50 or $100 on that sale. Salesman are portrayed as being dishonest to take advantage of customers, but it’s the dealership that makes all of the money… most of the salesman my husband works with don’t even have their OWN vehicle. And they sell $100,000 Porsches regularly. Just thought I’d add that 🙂 Your advice is generally good, and I definitely don’t promote going out and getting ripped off, just also realize that those salesmen have families and need a paycheck too, and the dealerships don’t pay them as much as we all think. We got a real education when my husband started in sales! Kaily – thank you so much for chiming in. I really appreciate your perspective. My niece used the most wonderful sales man recently and we appreciate all the time he took with her in making her decision. Sounds like your husband is the same way. You do have some really good information and most of it is really good advice. I would add that by telling people not to buy a warranty especially if they are buying used vehicles is a very bad idea. I have seen so many people ruin their credit because their vehicle needed a fix and they didn’t have a warranty, and had refused it at time of purchase. Telling people not to buy a warranty is tantamount to telling people not to buy insurance. In today’s automobile computers run everything, and not having “peace of mind” about the $20-40k vehicle because dealers make a profit off what they sell is not the best advice. Profit is not a dirty word. The rest of the article was pretty accurate. The one thing I would suggest to people buying cars is don’t lie to the salesperson about what you want or need, or that you are going to 8 other dealers that day. This only makes the process hard for the sales professional that truly is trying to help you find the right vehicle at the best deal.